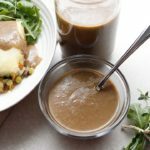 Make a double batch of this gravy! When you need to jazz up a meal, it will become your go-to sauce for everything! Poutine lover? Bake up some homemade fries, add some cheese and drizzle some of this gravy goodness right on top! You can thank me later! In a saucepot, on medium heat, add olive oil, onions, garlic, mushrooms, thyme, grated ginger and cook for 5 to 10 minutes. Add the broth, tomato paste, nutritional yeast, Tamari, and seasoning. Bring to a boil then reduce heat to low and simmer for 10 minutes. While things are simmering, add 1 tablespoon of arrowroot flour to a small bowl and mix with a little water or broth, and add it to the pot. Transfer everything to a high-speed blender or blend with an immersion blender, purée until smooth and return to saucepot. Enjoy right away, or keep warm until ready to eat. * Substitute with 2 tablespoons of either bbq sauce, ketchup or tomato sauce. Make sure the substitute meets your dietary needs. I’ve even added a large fresh tomato and it’s equally amazing! If you like your gravy saltier or with more pepper please season the sauce accordingly. Store leftovers in a glass jar in the refrigerator for up to 7 days. Tip: Are you feeding more than 4 people? Consider prepping a double batch!